What should you better choose for your site – a free or a premium HTML 5 template? This is an ongoing dispute that makes millions of people hesitant on the best ready-made solution for their sites. Well, tastes differ, as much as the purpose of downloading a website template. Some need html5 templates for educational purposes, while others look for an affordable and fully packed option for their personal or business websites. Taking all this into consideration, we have decided to make up a compilation of 50 HTML5 website templates, which includes both free and premium HTML5 templates. Varying in their style and functionality, all of these designs are beautiful and user-friendly. Just pick any and see it for yourself! 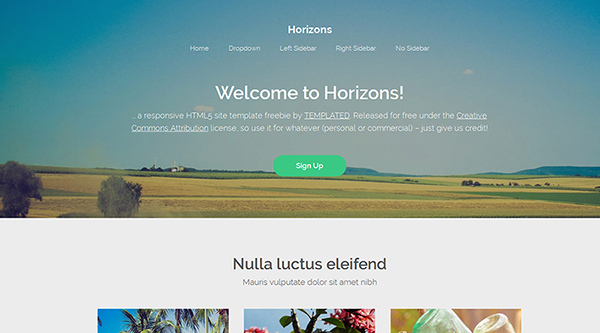 This free HTML template was made very touch-friendly. 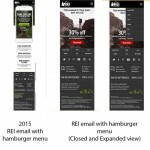 Just take a look at its hamburger menu icon. Large and noticeable, it was optimized to perform equally well across a variety of devices. On top of it, the icon is sticky. 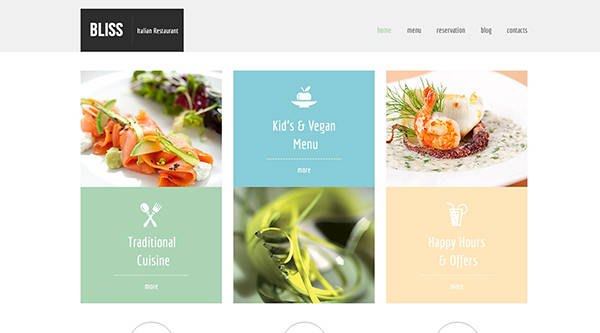 Best suited for cafe and restaurant websites, the template is rich in retina ready images, sliders and galleries. Build-up can become a rock-solid foundation of corporate, financial and investment sites. Created in a clean style, it doesn’t distract the users’ attention from the site’s content and lets the users get concentrated on your message. 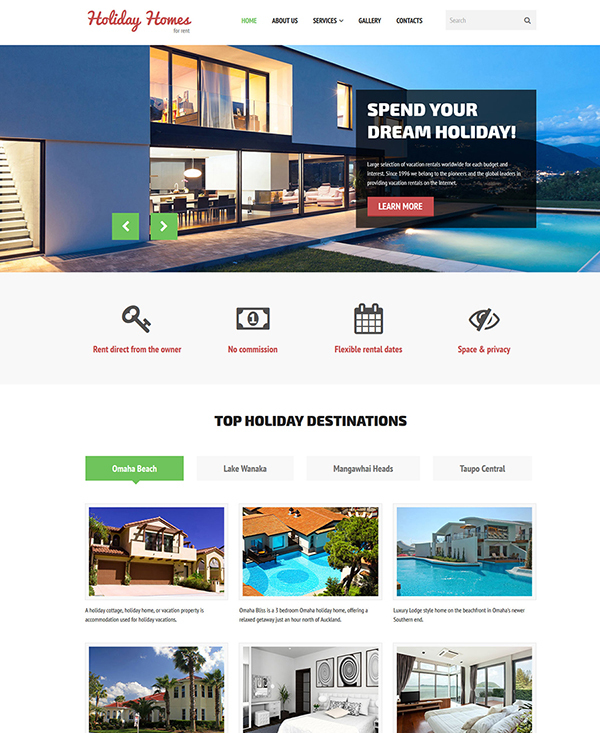 Holiday website will look bright and cheerful when built with the help of this HTML5 template. With the purpose to bring festive mood on the site, the template’s developers made use of bold CTAs, retina ready visuals and hand-written fonts. The template’s layout features plenty of white space, which brings the content to the forefront and makes the texts more readable. 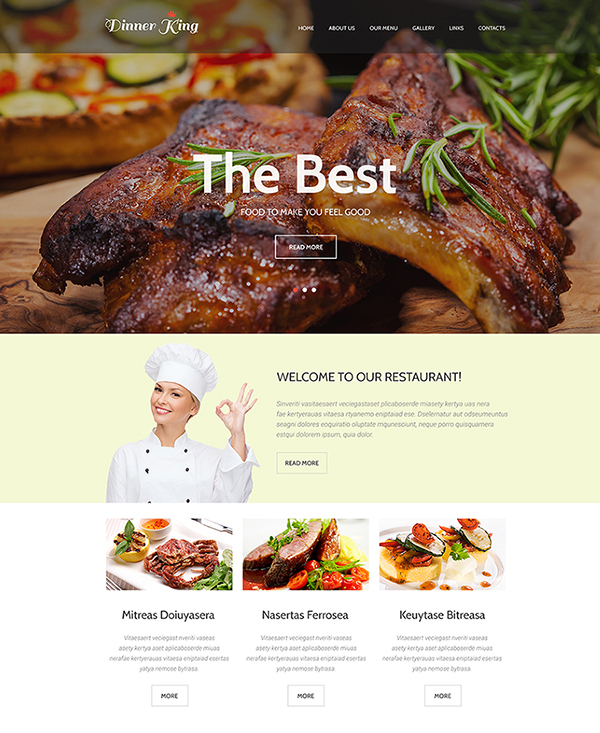 Cafe and restaurant websites can benefit from this freebie. Combined with soft, pastel colors of the design, retina ready visuals look even more outstanding. Grid-based content positioning allows you to organize plenty of data on the page in a well-balanced manner. Full social integration frees you from the necessity to search and install third-party plugins. 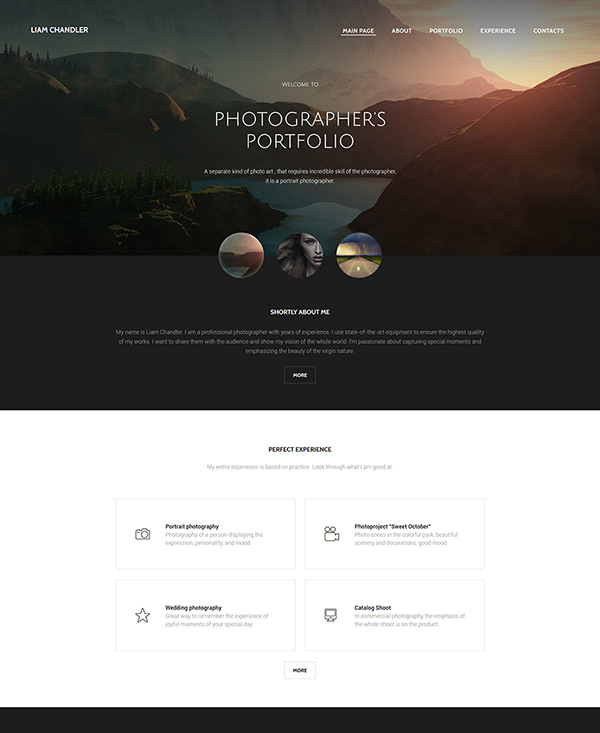 This is a ready-made HTML5 template for photographer and videographer portfolio websites. Timeline-based content organization makes the template different from the rest of designs on this list. Pre-designed pages for gallery, about, video and contacts are ready to go out of the box, just replace the default content with yours. Design and other creative studios will look breathtaking when built with this template. Single-page layout is very lightweight and easy to navigate. The main navigation bar remains in fixed position at the top of the page, allowing the users to leap to any data they wish with a click. 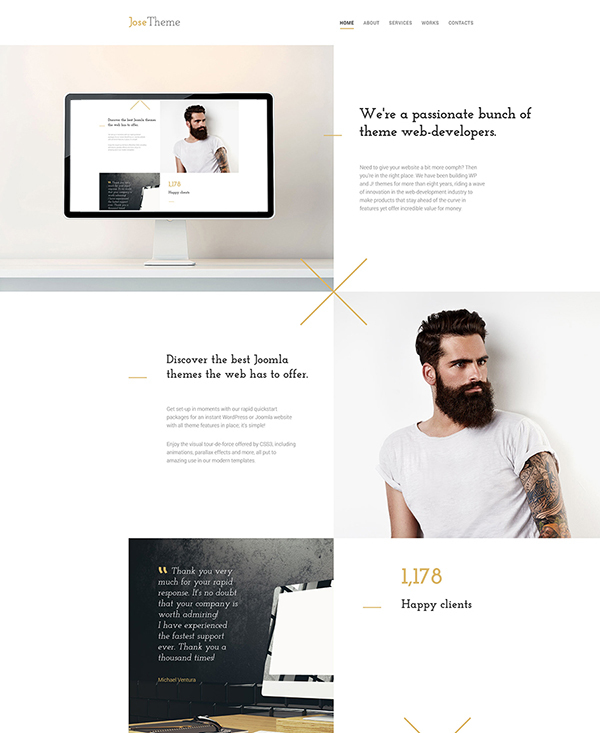 This is a trendy and stylish photographer portfolio freebie. 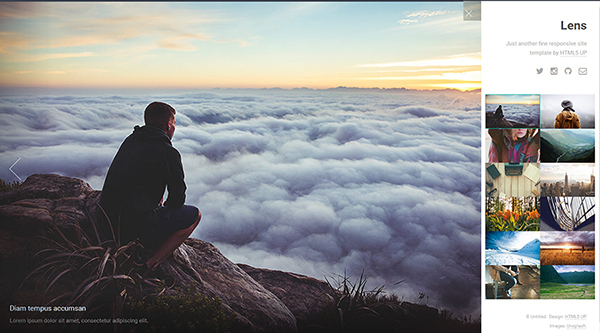 A split screen technique featured in the theme’s header allows you to introduce the audience to different types of content simultaneously. 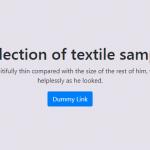 Rich in sliders and galleries, the template was made retina ready, so you may be certain that all your site’s content will be properly displayed across a variety of last-generation devices. 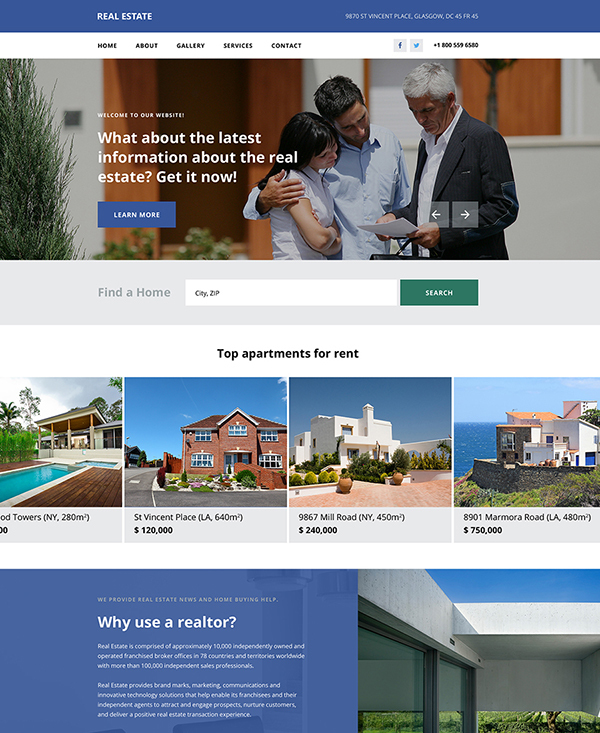 This masterfully designed free HTML5 template is best suited for architecture, real estate, design and hotels sites. Its clean layout created with the focus on details will make your site’s content stand out. 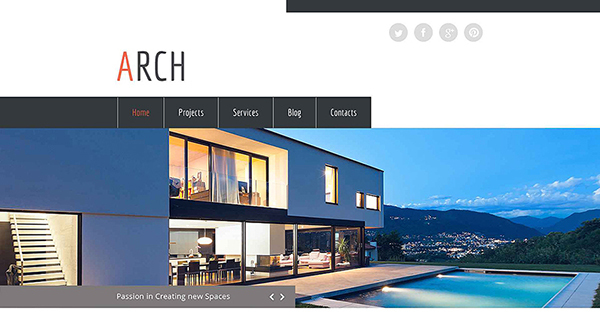 A sticky navigation panel allows the users to reach any page they wish with a click. Marathon was designed to appeal to true adventure-goers. 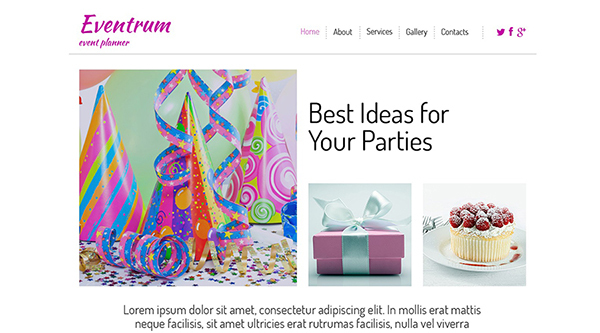 Pastel colors of the template will add a refined look to your website. Built-in countdown, full social integration, sliders and photo galleries – the template was loaded with a host of options intended to provide the users with an enjoyable browsing experience. 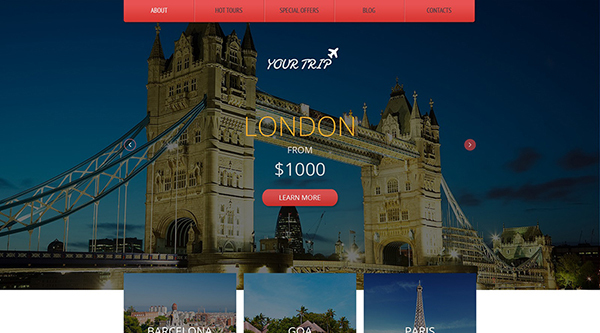 Travel websites can use this freebie for a quick start of their businesses. Coming loaded with a host of customization options, the template also boasts a trendy design. A booking form was pre-built into the template, allowing the users to make a reservation on the site. 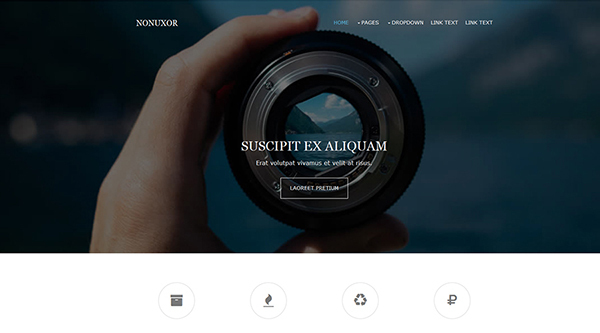 This minimalist free HTML5 template will be of great use to photographers and other creative professionals looking for a free website template to start their site. A 4-column layout allows you to organize plenty of content in a well-structured way. 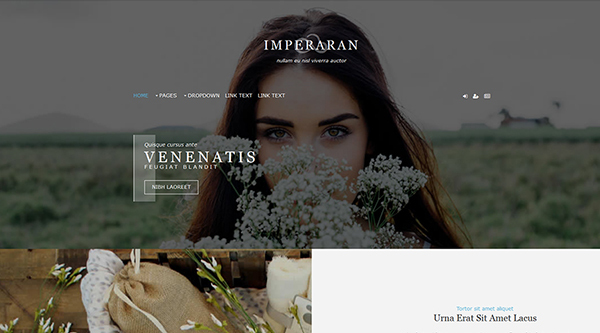 Imperaran is another cool freebie with a well-balanced 4-column layout, which can save tons of time and effort on web development. 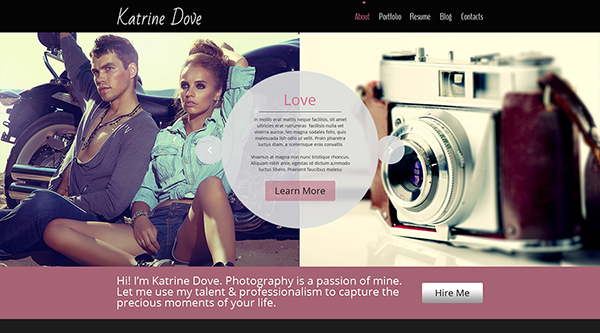 Intended for photography, design, model or fashion sites, the theme is intuitive in navigation and easy on the eyes. 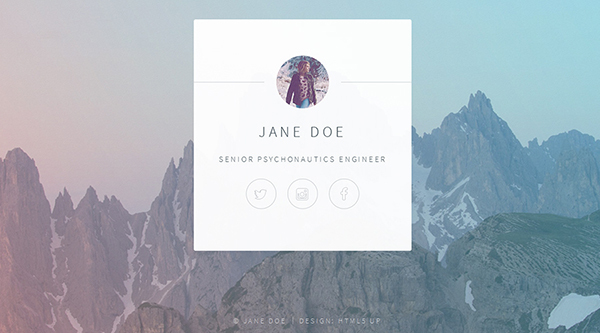 Ghost buttons with hover effect add a more refined and stylish look to the design. Running on a fully responsive framework, the template was written with the valid HTML5 code, which ensures a higher level of visibility of your site. The neutral color scheme and concise layout of the template will perfectly fit business and financial sites. The navigation bar features drop-down functionality, is fully customizable and easy to use. 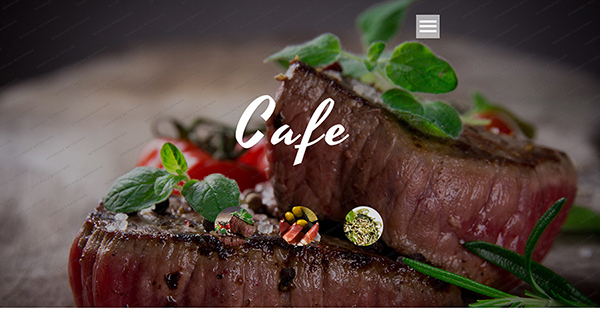 Cafe, restaurant or any other food related business can use this theme as a starting point of their website. 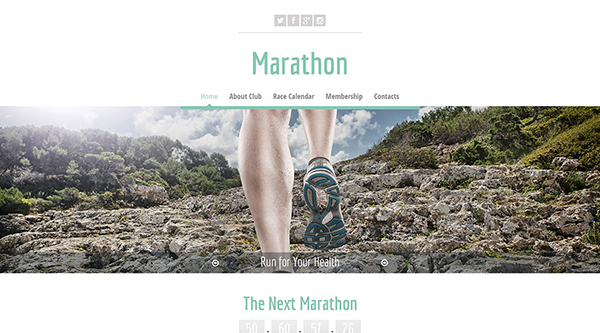 Coming loaded with a number of pre-designed pages, the theme can be customized to match your brand perfectly. 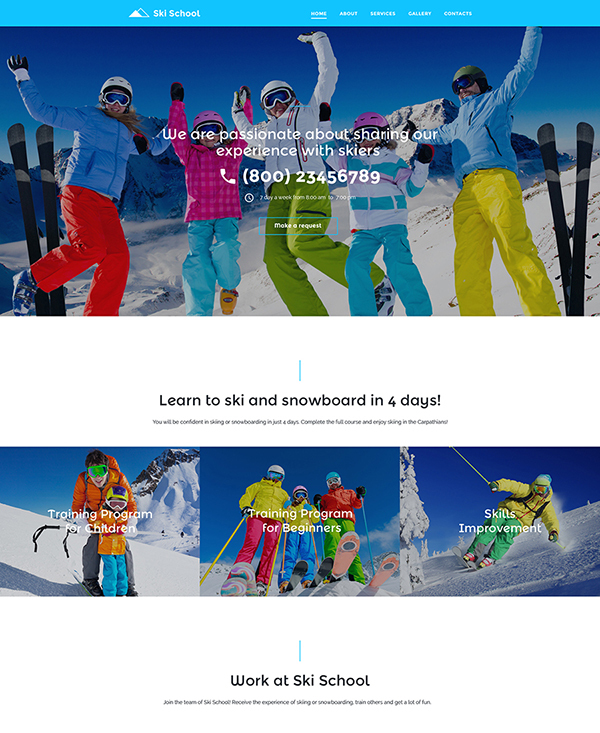 A full-width slider and high-quality visuals will help you present your business beautifully. 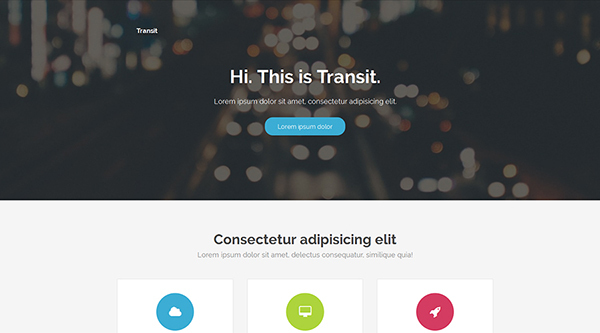 Transit is a responsive free HTML5 template built in flat style. The template is not rich in galleries or photo sliders. Instead, it features sleek and easy to recognize icons, which help to guide the users through your content. White space enhances the theme’s readability. When downloading this freebie, you will have several layout options to choose from. 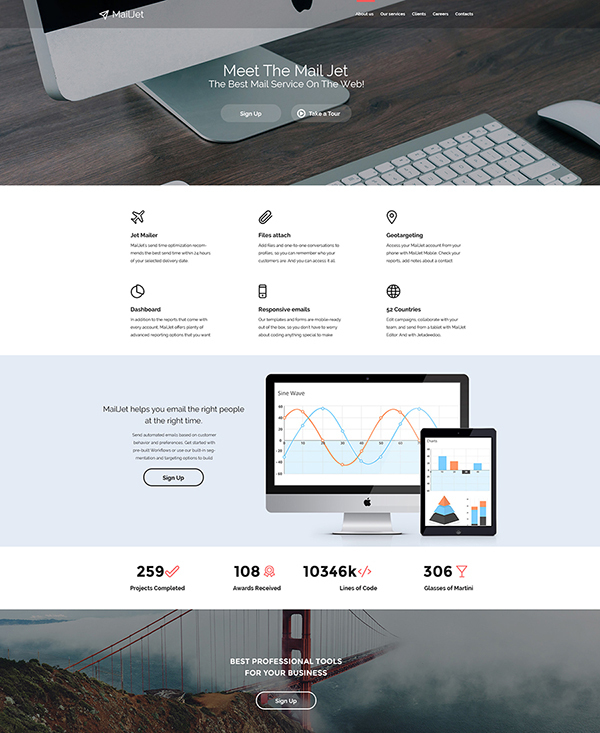 Clean, minimalist design of the template features a full-width positioning. A three-column structure allows to organize different types of content in an easy to navigate manner. The freebie can be used for both personal and commercial purposes. 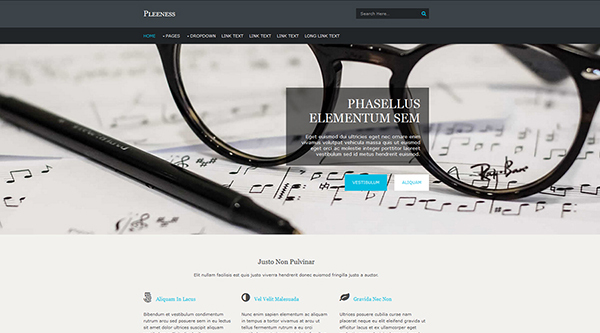 Valid code and a fully responsive framework bring the theme into line with premium website templates. A trendy look and a customizable back-end allow you to tweak the look and feel of the template any way you wish. Identity is a fully-responsive free HTML5 template, which is intended to present you to the world in a smart and effective way. Coming with 4 basic layout types, optimized for all major screen resolutions, it frees you from the necessity to spend time and effort on its adaptation for desktops, smartphones and tablets. Facebook, Twitter and Instagram social sharing options were integrated as well. 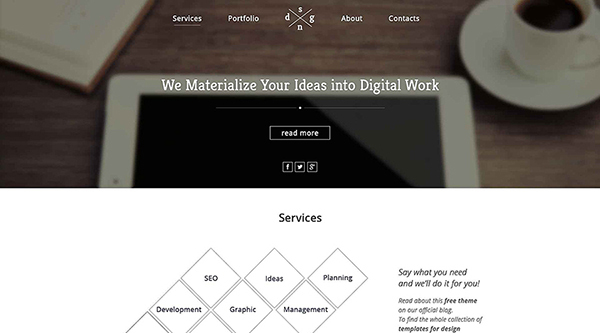 This creative single-page HTML5 template was also made fully responsive. A sticky left sidebar shows the users what kind of content they have reached and allows to navigate to any data they wish with a click. The theme’s footer features an integrated contact form and contact details. Lens is the last, but not the least responsive free HTML5 template on this list. 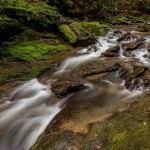 Best suited for photography portfolio websites, it looks creative and visually pleasing. Hamburger menu placed in the top right corner of the template allows you to reveal the hidden photo gallery with a click. 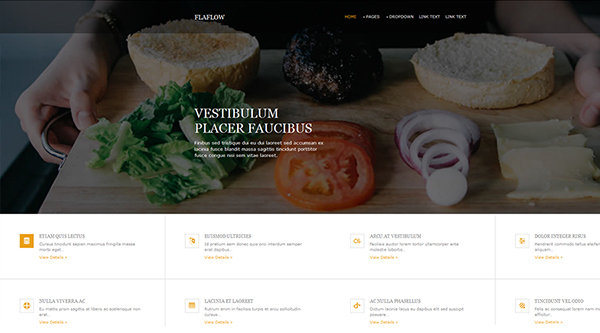 This premium HTML5 template is built on valid semantic code that ensures better SEO ratings and faster page loading. A fully responsive design ensures great performance on all devices and automatically adjusts all screen resolutions. 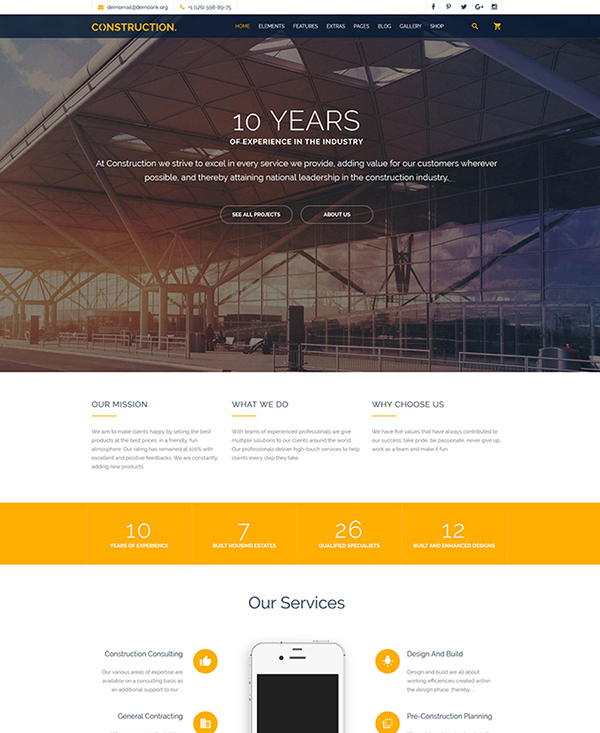 Buzarco is a professional HTML5 template by TemplateMonster that will be a perfect fit for corporate websites. It features a responsive layout and clean HTML5 code that ensures a clean and structured look, better protection of the website and faster loading speed. 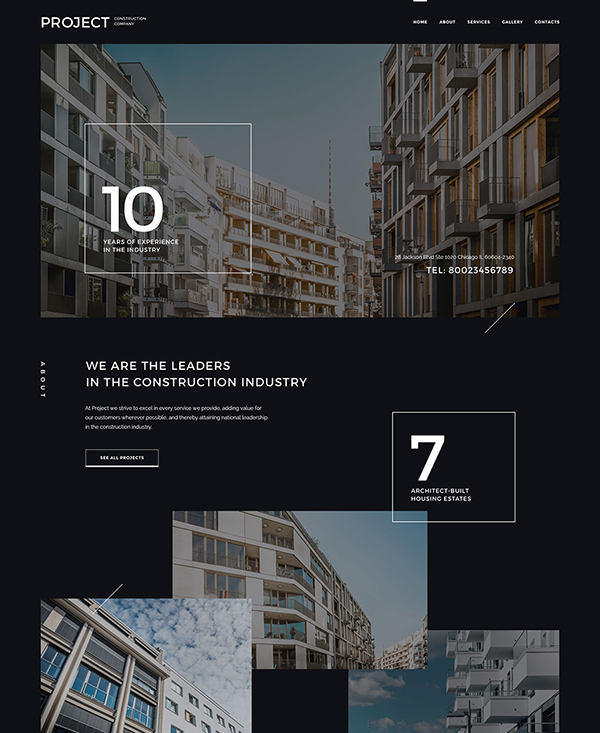 This premium template is specially designed for construction and building companies. A fixed mega menu ensures a top of the line performance and allows users to navigate to any section of the website on the fly. It also features an assortment of visual effects like parallax, hovers, counters, sliders, etc. 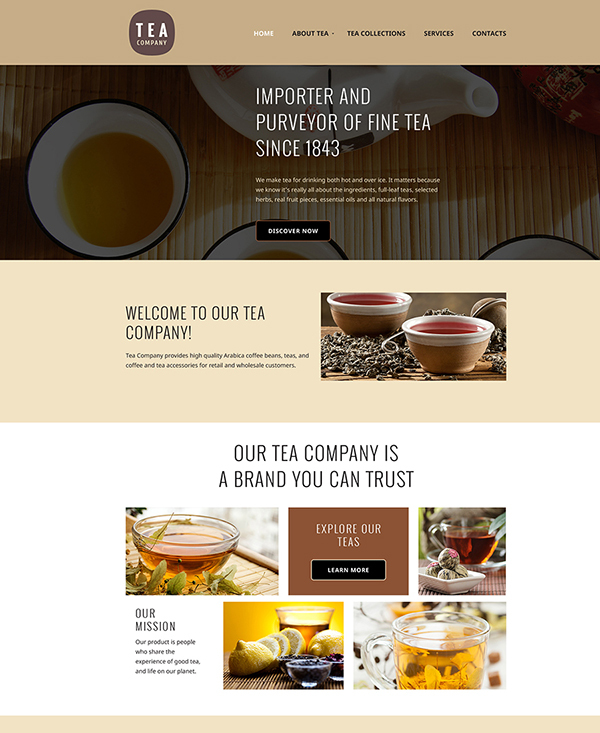 This professional template is specially designed for cafe and restaurant websites. It offers a great combination of style and functionality. A clean and minimal layout makes the content look clear and structured. 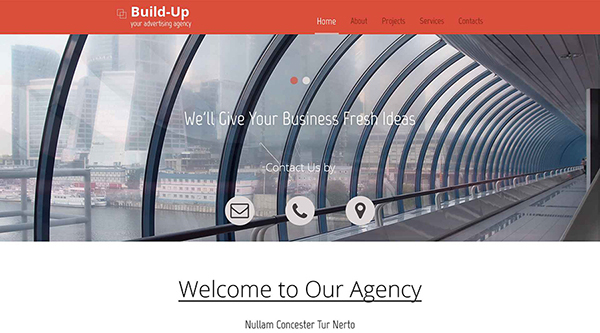 Here is a professional template for retailer agencies and construction companies. It features a clean layout and well structured code that ensures fast loading speed and an unmatched performance. At the same time visitors will be able to focus on the content rather than on visual effects. 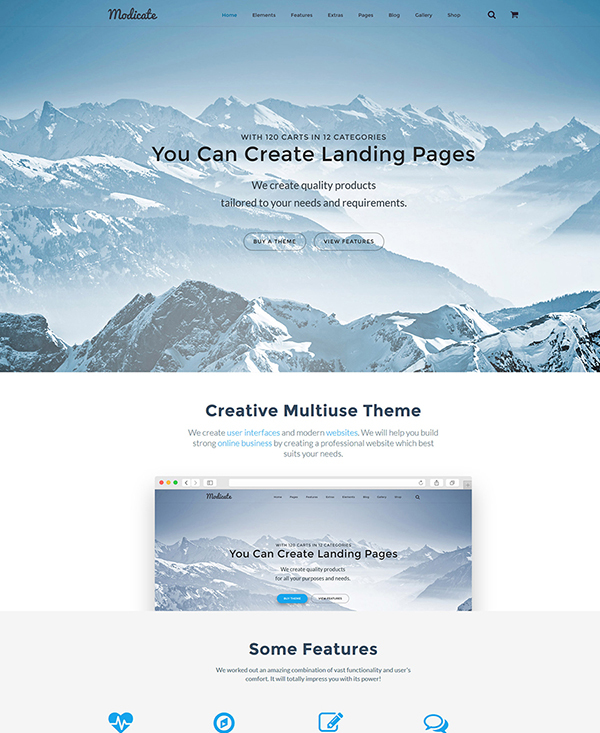 Modicate is a universal HTML5 template created by the guys from TemplateMonster that can be used for blogs, corporate websites and online stores. It comes loaded with a full assortment of features like, parallax, sticky mega menu, various kinds of galleries, sliders and carousels, sliders, etc. In this way it can be easily adapted to any project. 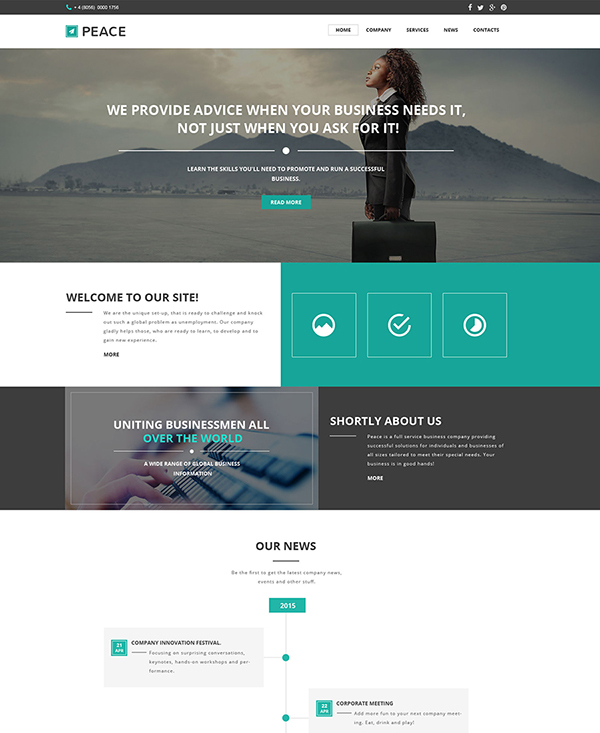 This HTML5 template is designed for corporate and business websites. It features a clean and minimal design with structured content blocks. A fixed top menu ensures splendid navigation and usability. 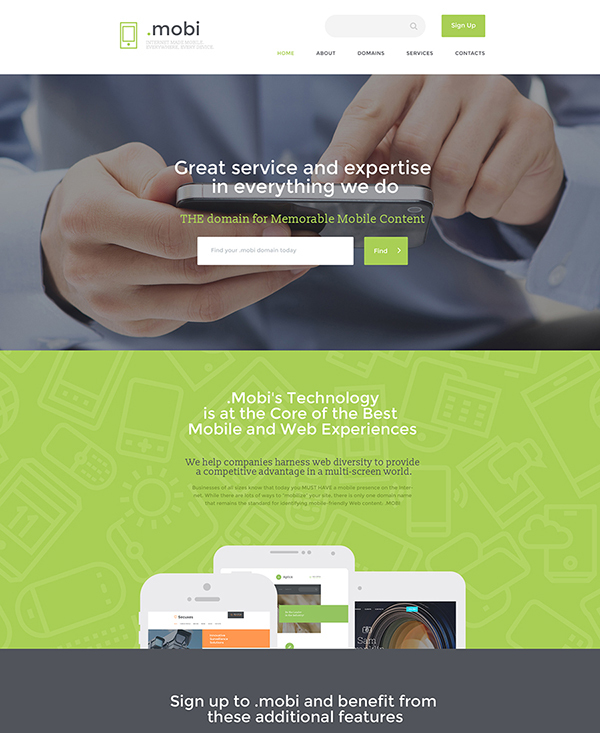 Use Mobi for tech and IT websites. It offers a clean look with lazy load that ensures fast and smooth loading speed. Thanks to a built in Olark Chat you can communicate with your customers much easier and answer them in real time. This template is designed in accordance with all modern standards and ensures a top of the line performance coupled with a fresh look. Thanks to an assortment of flexible options, it can be adapted to other projects in no time. 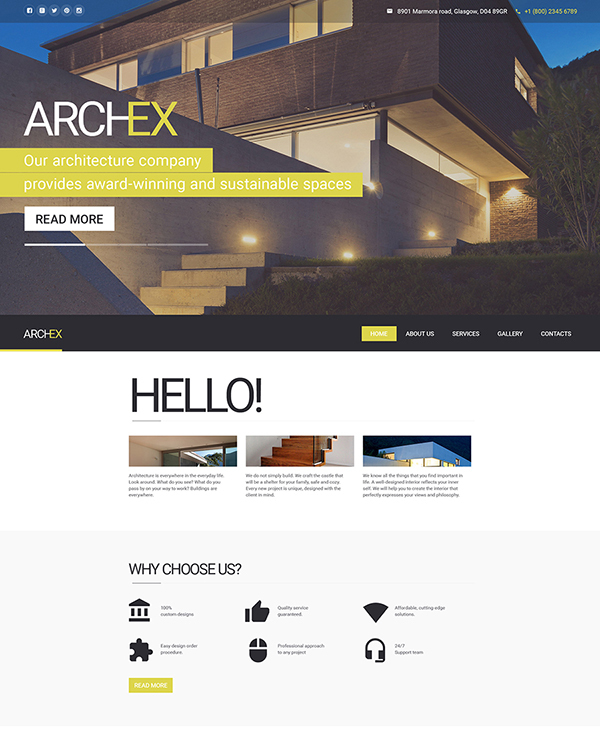 Architect is a professional HTML5 template created for construction and design companies. It offers a clean and minimal layout with diagonal style background that gives a bit of personal touch to the website. In this way, you get a site that is both attractive and functional. 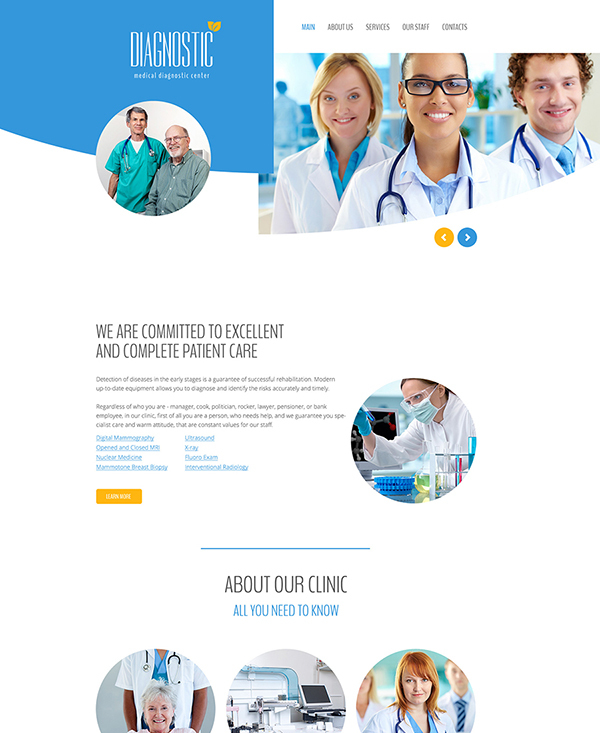 If you are looking for a proper solution for building a professional website for online clinics this is the right choice. 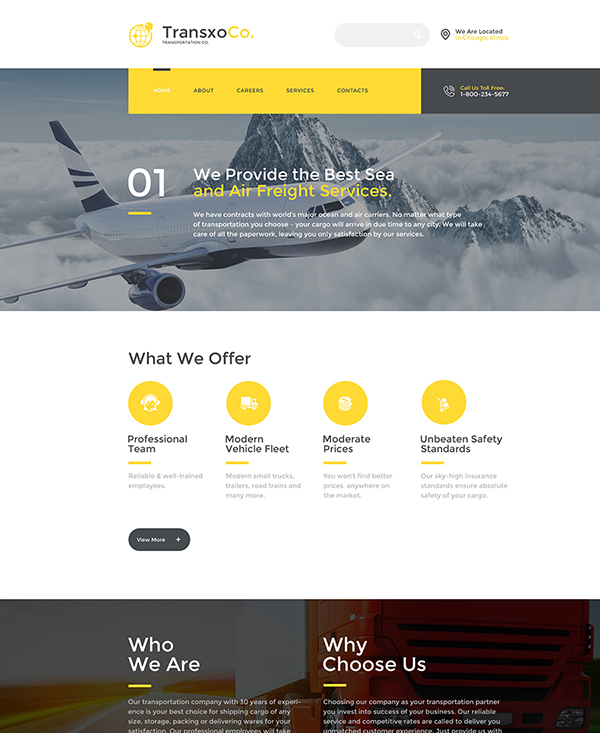 A clean and structured HTML code, and use of the font icons ensure smooth performance and fast loading speed of this html5 template. 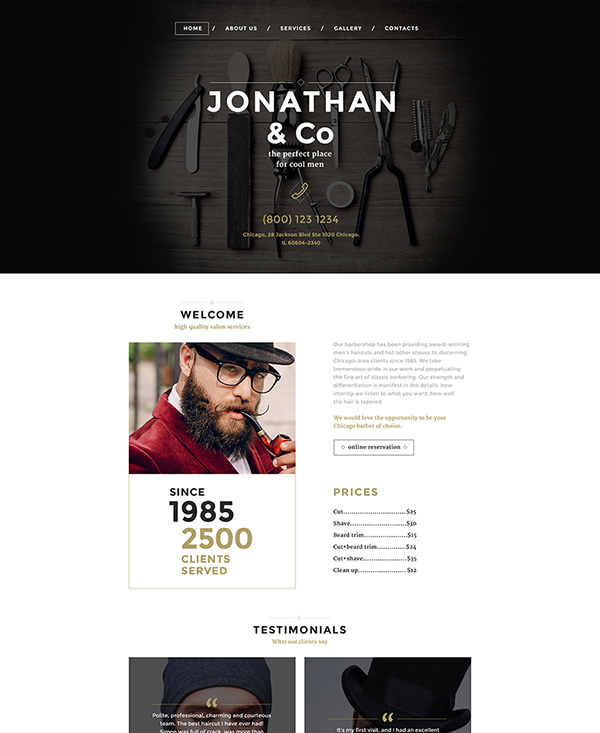 Originally this HTML5 template is designed for hair salon, but it can easily be adapted to any other project quickly and easily. 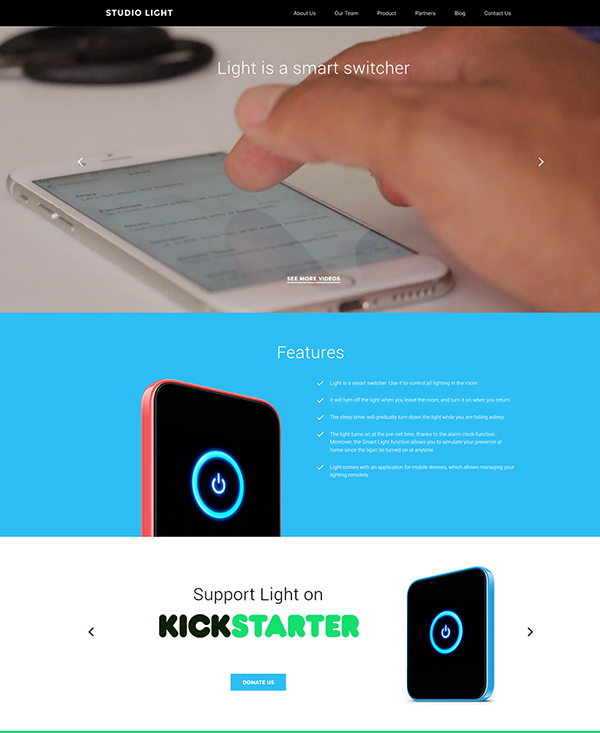 It combines a conservative look with some effects like images with parallax effect, hover, carousels, etc. 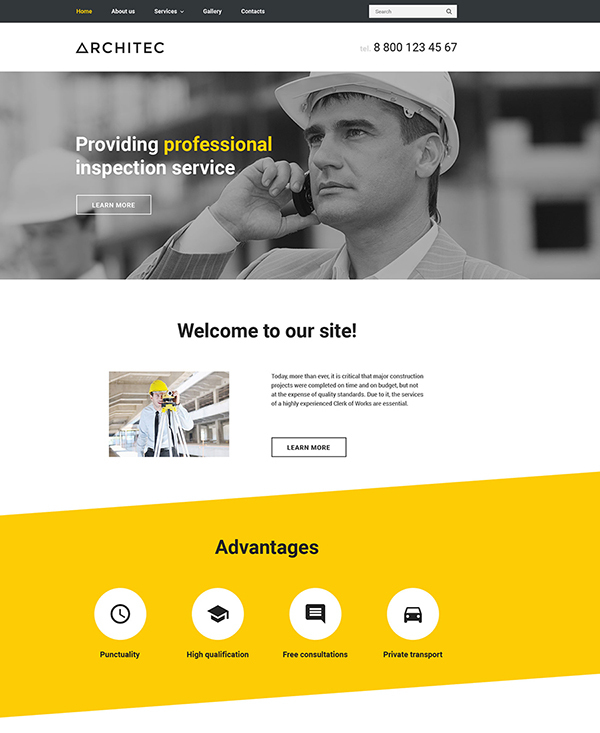 This template can be used for building a professional corporate site. It offers a clean layout with well-organized content blocks. A responsive design makes the template quite flexible and allows it to adapt to various screen resolutions without hiding the content. Peace is a great solution to start a professional business or corporate website. It features a flat design that does not overload the layout and make the content look clear and well-structured. The static elements of this HTML5 template ensure fast loading speed and allow visitors to focus on the information placed on the page. 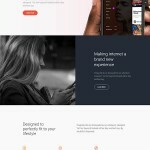 Use this HTML5 template for building a powerful website for educational sites and online courses. It offers a clean and neutral design and great navigation, so visitors will be able to navigate to any section of the website on the fly. Archex was specially designed for retailer agencies and offers a full range of tools and features necessary for a successful corporate site. 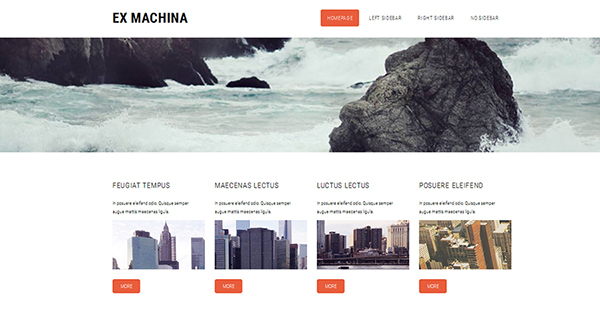 A full-screen slider, masonry gallery, image with parallax and much more features are included in the template. 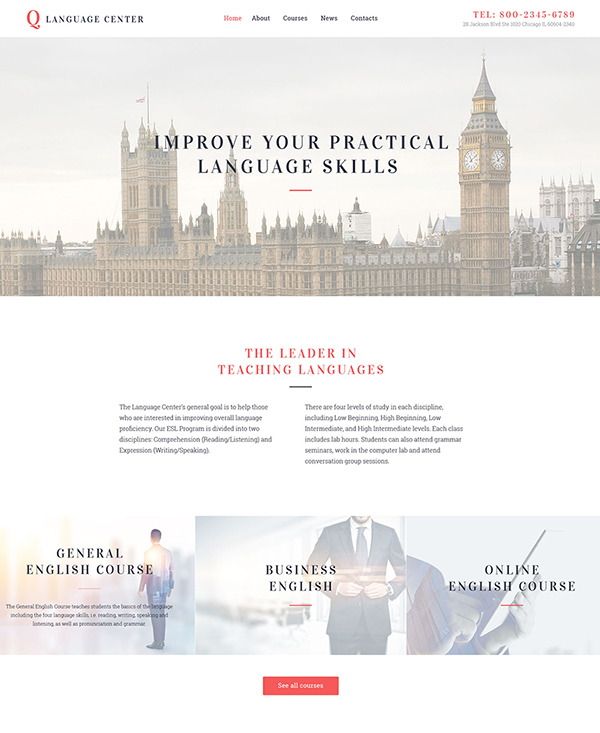 This template is designed for online courses and educational websites. 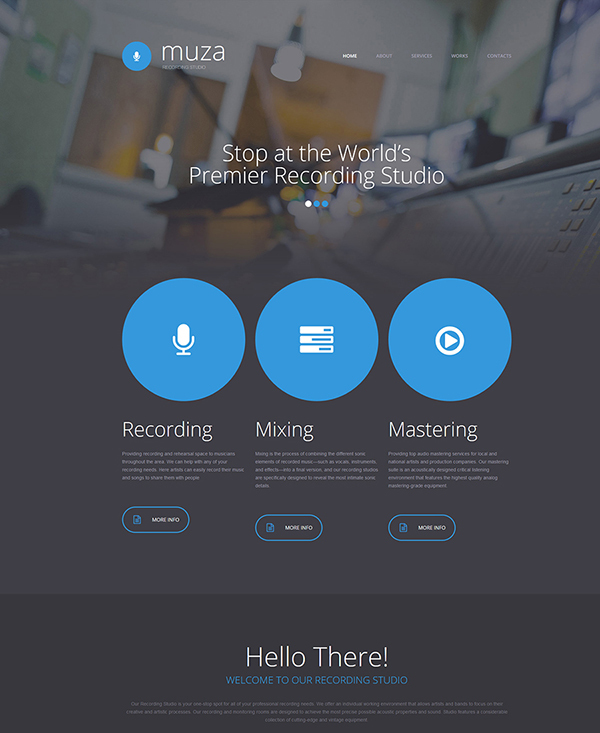 it comes loaded with an assortment of visual effects and plugins that make the site both attractive and powerful. 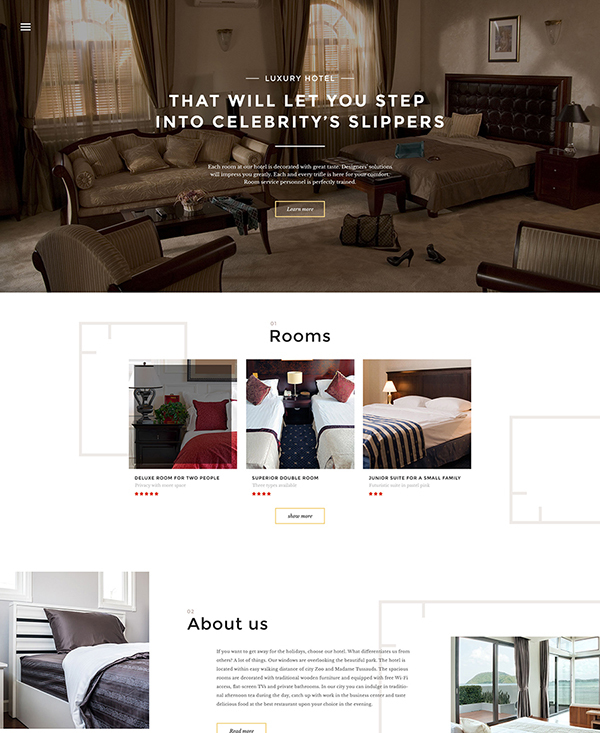 This template will be a perfect fit for building a site for hotels and retailer agencies. It is designed in accordance with modern IT trends and tendencies, and ensures an unmatched performance on all screens and devices. This HTML5 template will be a perfect solution if you need to build a professional tourist and sports blog. It features a clean layout with a few effects that result into faster loading speed and better navigation. 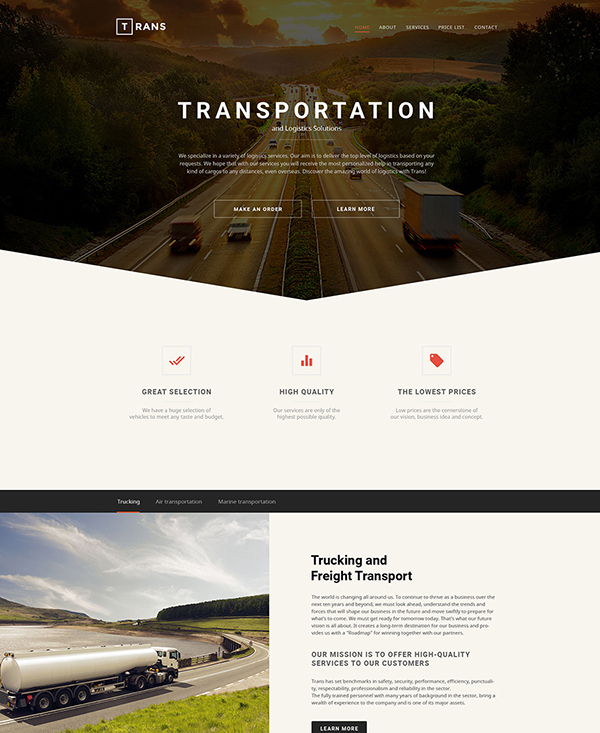 Transportation is a top-quality solution for building a corporate or business website. It offers a diagonal design with parallax images that give the template a bit of personal touch. Lazy load effect makes the template load faster as it displays the elements that are in the viewport. Specially designed for retailer agencies, this HTML5 template ensures splendid performance and navigation on all possible screen resolutions. 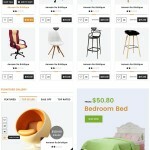 It offers a clean and well organized layout that allows users to focus on the content and take the right decision. Here is a great solution for building a professional online portfolio or CV. It includes all the components that will help you find the job much faster. You can write a quick review about yourself, mention your skills and place some of your works in the galleries. 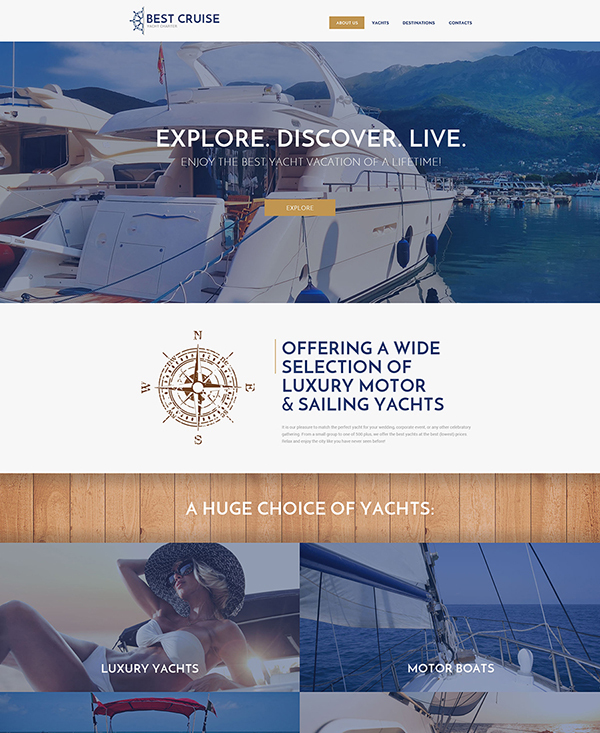 This HTML5 template will work for cruise and marine companies. It is not overloaded with visual effects and at the same time looks quite expensive. You can use it for both blogs and corporate sites. Here is another solution for education websites. 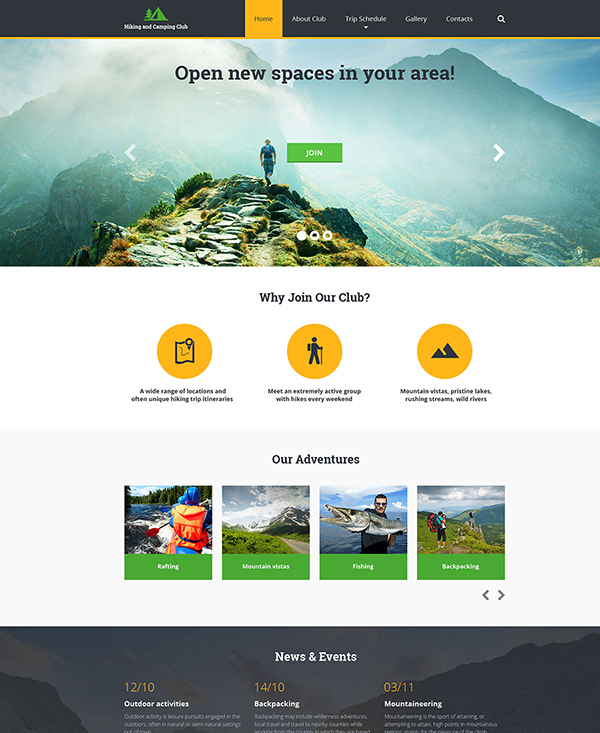 Thanks to a well structured layout you can place here any content about the school or courses. A fully responsive design is another feature that will make the site accessible for mobile devices. 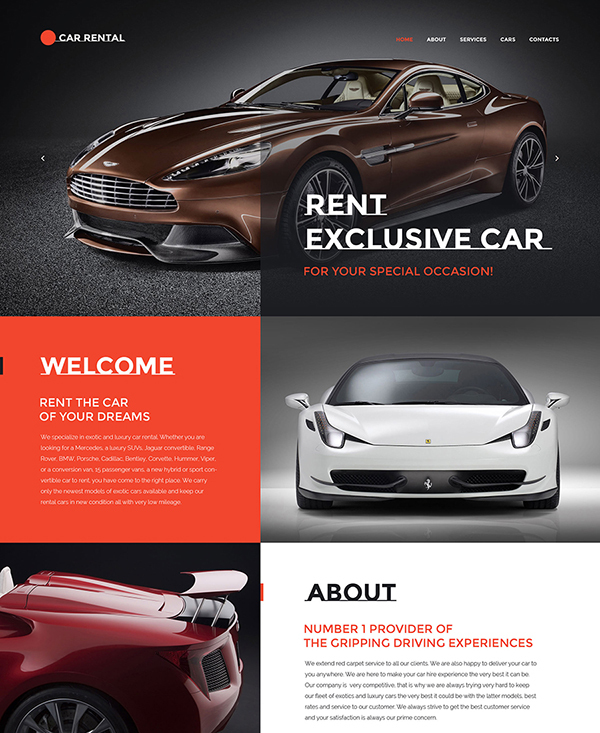 This template can be used for corporate and auto blog sites. It combines a compelling look with top of the line performance. The template also features a blocked layout that makes any content placed on it look distinct and clear. This template is a perfect solution for building a professional portfolio for designers and photographers. It features well-organized content blocks, masonry style gallery, etc. In this way you will be able to showcase any information in the best possible way. MailJet is specially designed for business and corporate sites. It offers a static layout with sticky menu and font icons. Thanks to all these features it ensures fast loading speed and an unmatched performance on all modern devices. 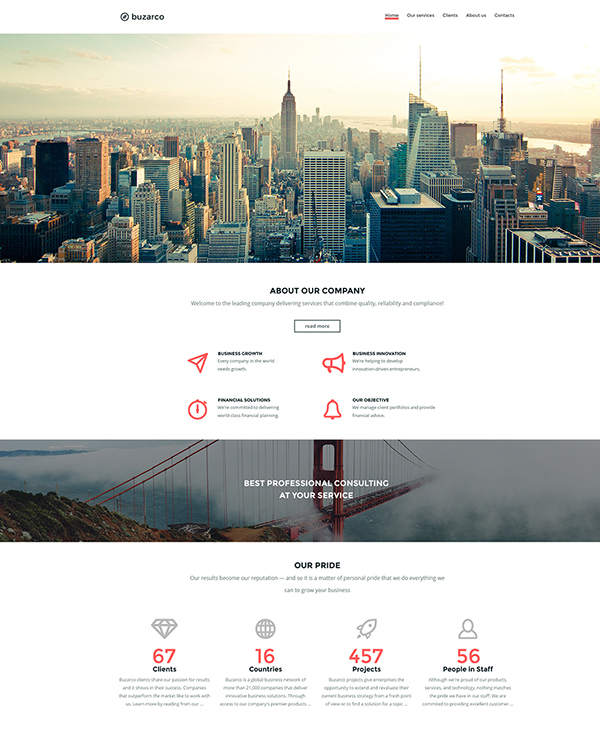 Use this template for building a stylish corporate website. Thanks to a clean and fully responsive layout and lazy load effect, it ensures a cutting edge performance on all devices. 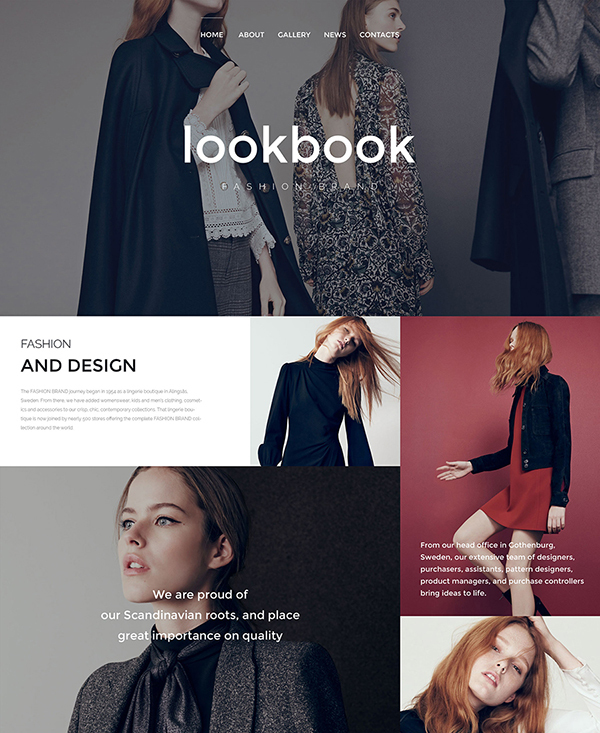 Here is a stunning HTML5 template for fashion blogs. It offers a clean and well-structured layout coupled with cutting edge functionality. Thanks to a full responsive design the template automatically adapts to all screen resolutions. 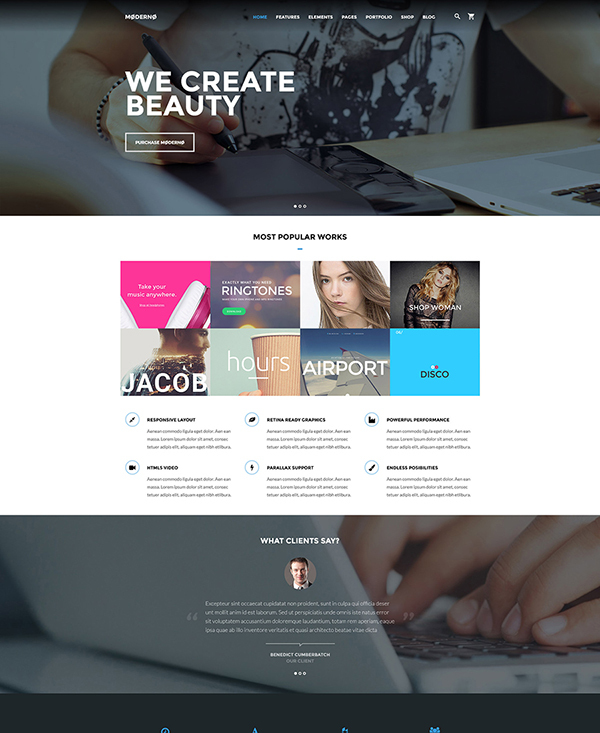 Modern is a professional multipurpose HTML5 template that can be used for almost any project including blogs and online stores. It features a fixed mega menu that ensures an unmatched navigation. 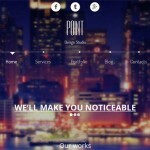 An assortment of visual effects like parallax and hover give it some fresh style. 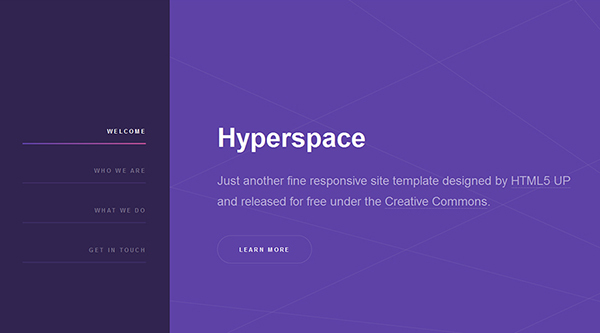 These were 50 of the most popular and breathtaking HTML5 website templates, which were created with clean, valid code and optimized to run smoothly across a variety of devices. We hope that this compilation will be useful to you and you will find a ready-made solution to breeze fresh air into your new or existing web project. 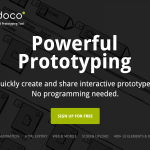 Free or premium, all HTML5 templates are at your disposal. Just pick any and get ready to present your project, business, organization, etc. to the world. Now, we would like to hear your opinion. What templates from the compilation did you enjoy the most? 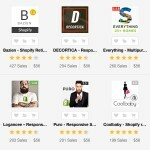 Do you know any other free or premium HTML5 website templates that are worth to be mentioned on the list? Feel free to share your thoughts in the comments to this post.